Anyone with even a mild interest in technology knows that the iPhone 4S launched one week ago today. In what has now become a ritualistic media event, the new iPhone launch was covered in scrupulous detail, from pre-launch sales predictions, to pundit reviews, to interviews with Apple fans waiting in line to get their hands on the newest iProduct. Someone even made a website devoted to funny things Apple’s new voice command application, Siri, says. The hype tumbled into this week when people awoke Monday morning to find their RSS feeds ablaze with news that Apple had already sold 4 million iPhone 4Ses. Yesterday, AT&T said it had activated 1M iPhone 4Ses so far. iPhone 4S distribution expanded to 22 more countries -- that's 29 in all -- today. Indeed, it feels like everyone in the world has iPhone on the mind. Well, maybe not everyone. Actually, not even close to everyone. Most everyone, in fact, did not hear about the new iPhone launch or, if they did, they don’t care. Most of the world’s population has more pressing things to focus on than Siri's pithy answer to the meaning of life. Things like staying fed. Finding shelter. Mitigating the scourge of dire poverty and lack of opportunity for a better life. For many more billions, other recent technologies or innovations matter more than iPhone 4S. Almost half the world -- over three billion people -- live on less than $2.50 a day. At least 80 percent of humanity lives on less than $10 a day. Rural areas account for three in every four people living on less than US$1 a day and a similar share of the world population suffers from malnutrition. So using the world’s population as the metric, the launch of the iPhone 4S last week, and even its 22-country expansion today, isn’t big news at all. For most, gadgets like the iPhone 4S are utterly unattainable. For tech to be meaningful to a world audience it must be, first and foremost, affordable. But wait, isn’t the iPhone 3GS free now? And the iPhone 4 only $99? Indeed, but those are carrier subsidized prices. Carrier subsidization is largely not available in many developing nations, like India. Customers in these markets pay full price for their feature phones, which makes iPhone unattainable to all but the most affluent. Everyone else is left out in the cold. Luckily, there are gadgets that seek to bridge the digital divide. These gadgets are not the stuff of sleek industrial design and precision displays. Rather, this tech is stripped down, bare bones, gritty. Yet what it lacks in aesthetics, it makes up for in potential. Potential to change the lives of billions -- for the better. "There are some moments in history which will be milestones recognized by future generations. This is one such moment". No, this isn’t Apple CEO Tim Cook talking about iCloud, iOS 5 or iPhone 4S. These are actually the words of Indian Minister of Human Resource Development, Kapil Sibal, during the recent launch of the Aakash tablet computer. 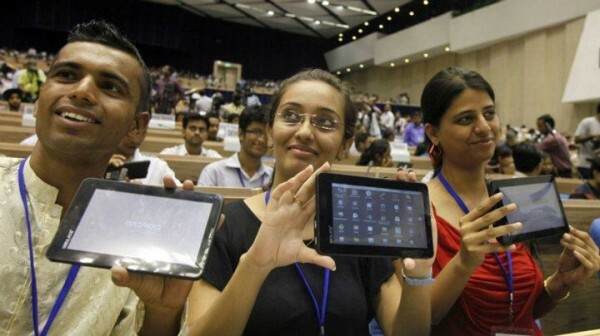 The Aakash is a (very) low end 7-inch, Android 2.2 powered tablet computer targeted primarily at India’s students and rural poor (India has the world’s second biggest population). The tablet is certainly no "iPad killer", sporting a resistive-touch screen, 256 MB of RAM, 2GB internal memory, a paltry 366MHz processor, and 800x480 display. Yet this all comes into perspective when you hear the Aakash’s price: $35. For $35, this tablet actually packs some serious bang for the buck. It uses compression technology to shift processing during web browsing to the cloud to make up for the slow processor and can run many different document and multimedia formats (full list of specs here) It also has access to hundreds of thousands of Android apps. Not too shabby for the price of a nice dinner out here. It is worth noting that the $35 price target of the Aakash is due to a subsidy by the Indian government to make it more affordable to Indian citizens. The actual price the Aakash government pays is $50. This price is determined based on bulk purchasing by the government and the listed price it will sell for on the regular market is around $60. UK and Canada-based DataWind manufactures the tablet and states that higher-end models will eventually be launched in United Kingdom and United States. Yet Sibal is unambiguous in his view as to whom the Aakash is intended: "Today we reach to the sky and demonstrate what is possible. Let me send a message, not just to our children but the children of the world: This is for all those who are marginalized". The Aakash is technology for the masses, not the classes. It is a rare success story where the efforts of government and private industry have converged to bring technology and information to the traditionally disenfranchised. It may not be pretty but, at $35, it doesn’t have to be. Earlier this year, the Chinese firm Huawei unveiled IDEOS through Kenya’s telecom titan, Safaricom. So far, this $80 smartphone has found its way into the hands of 350,000+ Kenyans, an impressive sales number in a country where 40 percent of the population lives on less than two dollars a day. As with the Aakash tablet, Huawei keeps the price of the IDEOS down by using low-end hardware and open-source Android (2.2). While the specs can’t stand up to the iPhone 4S or other high end smartphones, they are good enough to make it work for people that otherwise wouldn't have access to a computer. 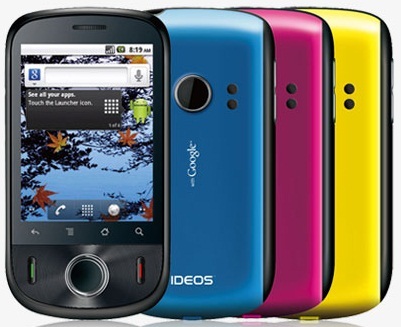 Additionally, a Kenyan with an IDEOS (or another smartphone running Android) has access to hundreds of thousands of Android apps, many targeted specifically at the needs of the Kenyan people. By lowering the financial barrier to entry with commodity hardware and open-source software, the potential for smartphones to improve the lives of hundreds millions, if not billions, is profound. One of the problems with both the IDEOS and Aakash tablet is that they both have relatively poor battery lives. This can be especially problematic in rural areas without consistent access to reliable power sources, a very common issue for the targeted audiences of both devices. This panel captures energy from the sun and allows the user to recharge the battery automatically and without cost. Using about 2 hours of bright-mid-day sun, the user can charge the battery life by one hour. A fully charged battery allows up to 14 hours of usage, and the battery can be charged up to 1000 times over 3 years. 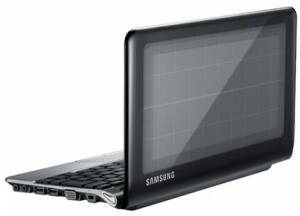 While a solar powered netbook wouldn't do much good where I live in Portland, Oregon, it has huge potential in sunnier sub-Saharan Africa, one of Samsung’s target markets for the NC215S. Another benefit is that devices with poor battery life like the IDEOS or Aakash can be charged from the solar powered netbook via a usb connection. Outside of the solar panel, Samsung has created a netbook that is pretty much on par with the others on the market, with an Intel Atom processor, 1 GB RAM, 10.1-inch screen and 240GB hard drive. In Kenya it sells for 35,000 Kenyan shillings, or about $355 US -- still expensive for many but cheaper than a traditional laptop. The fact that it is also a portable recharging station makes it a compelling solution in countries with spotty power grids and sunny climates. What this means is, for $25, inexpensive peripherals, and an Internet connection, someone can have a functional desktop computer capable of executing basic computing tasks like word processing and accessing the Web. While this would probably not be a computer to edit movies on, videos of Rasberry Pis running Quake 3 and serving as a remote desktop client demonstrate that a basic computer is more capable than one might think. The Rasberry Pi has huge potential in education, where an impoverished school can build a computer lab for dirt cheap using Rasberry Pis and surplussed peripherals. These devices only run on ARM, meaning no Windows, but this also means that the OS and software will be open source and free. Schools can additionally utilize free productivity tools like Google Apps to make up for low-fi specs with the power of the cloud. The Rasberry Pi will be available worldwide starting in November. It’s easy to forget sometimes how lucky we are to live in an affluent, developed nation. Even with our current economic malaise, American citizens still have it better than the vast majority of the world’s population. This is largely why we get so worked up over product launches like the iPhone 4S. We can. Yet for most of the rest of the world, it is the technological race to the bottom, rather than the top, that excites. The nexus between commodity hardware, open-source software and cloud computing is bringing the greatest repository of information the world has ever known -- the Internet -- into the hands of those that have traditionally been shut out. And while it’s entertaining to watch blue shirted Apple employees hi-fiving customers as they run out of the Apple store clutching their new iPhones, it’s actually moving to see the bubbling excitement a cheap, low-fi $35 tablet brings to the Indian student at :51 in the video above. I’m struck with how, for this young man, the significance of the technology he describes is not the object, but rather the opportunity that the object affords. Lucky for him, and hundreds of millions of others like him, the future seems ripe with such opportunity.